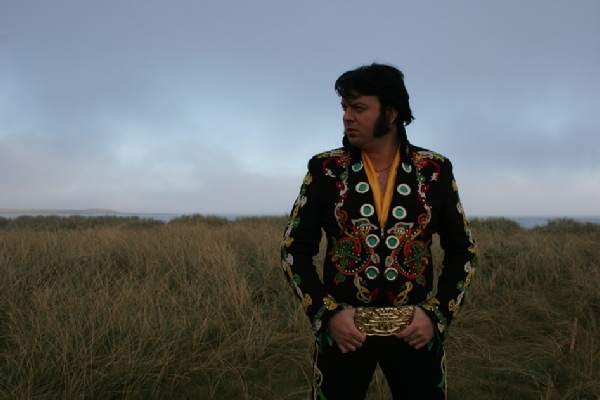 Over the past twenty years Mark Leen has become the most successful Elvis impersonator or ETA (Elvis tribute artist) to emerge from Ireland. He announced he was to hang up his jumpsuit and retire his stagename as a mark of respect to the King. Elvis Presley died in 1977 aged 42 and Mark, who turns 42 this year, said he feels it wouldn't be respectful for him to continue to perform as Elvis at an older age than Presley himself ever reached. 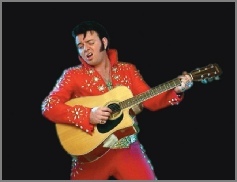 Mark told The Kerryman that he planned to retire his Emerald Elvis personna with a series of large concerts at the INEC in Killarney in Jan 2013 which he has organised to mark the 40th anniversary of Elvis' legendary Aloha from Hawaii concerts, Mark duly did as he said and on Jan 11/12/13 2013 the Gleneagle Complex in Killarney was once more filled to capacity along with several other hotels in the town to cater for the influx of Rock n Rollers, Elvis and Emerald Elvis fans. "I've always tried to be historically accurate with my shows. 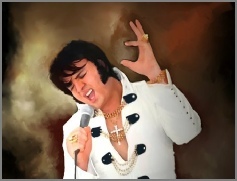 Elvis never reached 43 and I always said I'd never perform as Elvis at that age," said Mark. Mark said that he want's to make sure his Emerald Elvis personna retires in style. 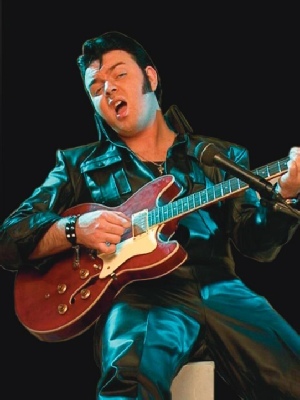 There was a huge petition signed by thousands of people handed in to the local news paper office in Tralee just days after Mark's final concerts, and the Kerryman ran a front page story which featured an Elvis Tribute Artist outside of Mark Leen's Graceland Style gates begging him not to retire as Elvis. The Front page headline read Don't Be Cruel Mark. 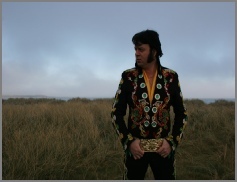 "I've been performing as the Emerald Elvis since 1997 and I wanted to go out with a bang. I didn't want my last Emerald Elvis show to be in a pub in front of a few people. I wanted to retire the Emerald Elvis in front of a packed house at the INEC". 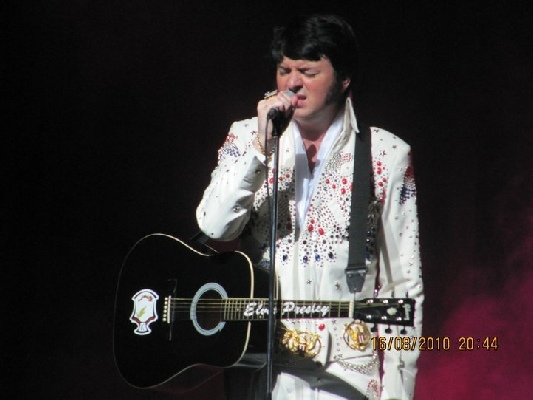 Mark was joined on stage by the Stamps Quartet who played with Elvis in 1973 at the Original Aloha Concert and at the end of the show Mark threw his cape out into the crowd, just as Elvis did. 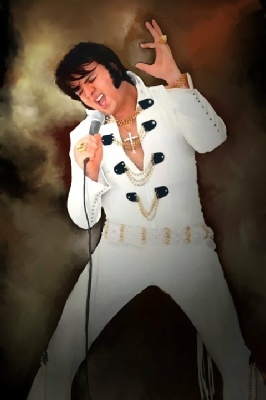 Mark has been performing as the Emerald Elvis since 1997 when he was asked to put on a full costumed show to mark the 25th anniversary of the King's death. 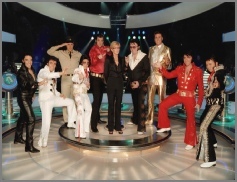 Since then his career as the Emerald Elvis has seen Mark Leen travel the world and perform for the likes of Bill Clinton, Ronnie O Sullivan, Jimmy White and Ken Doherty, as well as making regular appearances on TV and radio. He has appeared on BBC'S World's Greatest Elvis competition and the Weakest Link Elvis Special and he is also a regular contributor to RTE radio's Funny Friday show on Liveline. "I'm amazed where the Emerald Elvis has taken me. I feel very humbled and it's been an amazing experience," he said. I've played in many non English speaking countries where they love Elvis he said. In his Career as an Elvis Tribute Artist, Mark Leen was voted best Elvis Tribute in Europe, Winner of the 50th Anniversary of Rock n Roll Competition, Winner of Porthcawl Elvis Fest, Winner of the Ideal Elvis/Elvisly Yours London Competition, and finished 4th on 3 occasions at the Collingwood World Elvis Festival. 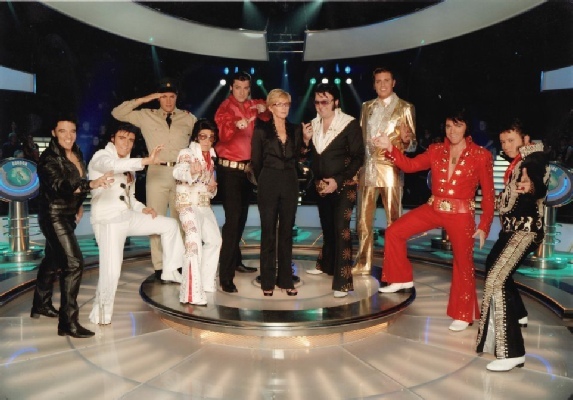 After seeing Elvis Tribute Acts in every continent of the World, host of the Worlds Greatest Elvis Vernon Kaye said on Camera " We'd like you to come to London Mark, because your the best we've Seen"
He was so good in 2002 in Blackpool England I even joined him on stage to sing Johnny B Goode with him, something I never got a chance to do with Elvis." 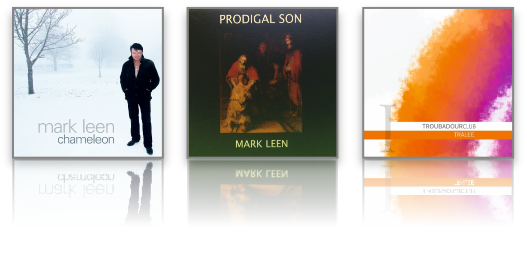 Mark Leen has helped to raise hundreds of thousands for various charities in Elvis Name. Stepping down at the age Elvis died at has been met with sadness by many and respect by others, Derek Mooney on RTE Radio 1 said "I respect Mark for taking this decision, he is truly great at what he does"
Mark has brought, Al Dvorin (RIP) The Sweet Inspirations inc Myrna Smith (RIP) and The Imperials Quartet and The Stamps Quartet to Killarney Ireland. 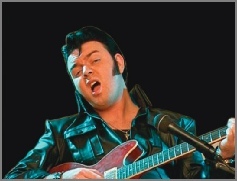 Ed Enoch of The Stamps said," Mark is a truly great tribute to Elvis and we were honoured to play and sing with him, that boy sure knows his Gospel Music." "Ladies and Gentleman, Elvis has left the Building"
As Mark exited the stage in 2003 Al came on and said, "this guy is not good he is great, and a great man, a true professional and a very nice guy, this show is the best I've seen and I haven't felt like this for a long time, Ladies and Gentlemen, Mark - The Emerald Elvis has left the building, thank you and good night.